Last Friday was an exciting day. We got two hate mail letters. 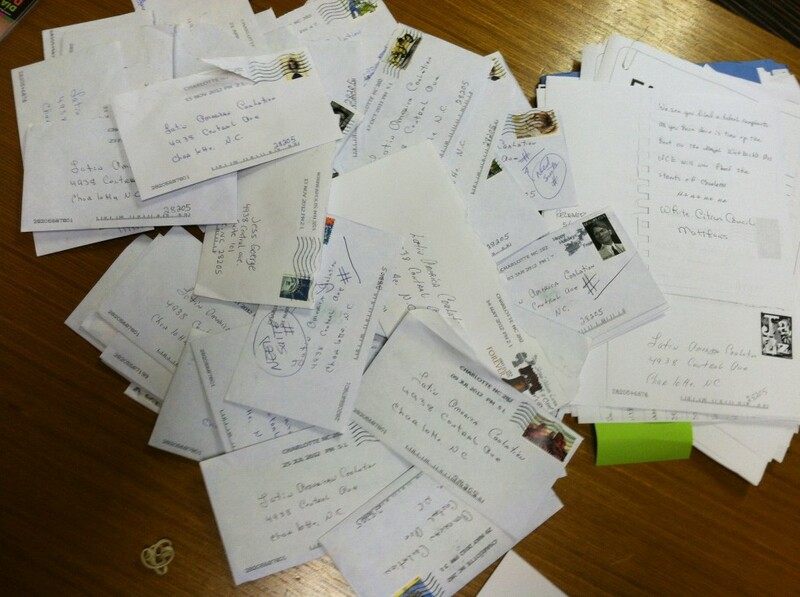 We are no strangers to hate mail at the Latin American Coalition. In fact we often make opening hate mail a sort of office ceremony– a production where we all gather round as I read the terrible, ugly and grammatically incorrect contents. The words are often disturbing, but we find humor in the strangest places. The stationery can be amusing too. Recent letters have come on paper featuring a charming, autumnal motif. Others arrive folded in much the same way a middle school student might wad up a torn piece of notebook paper to be passed in class. For a while, when we were receiving more threatening letters, I would open them wearing industrial, dish-washing gloves as to not get my fingerprints on them. This, I promise, was no easy feat. While I could have gotten some tight latex gloves to ease the letter opening process, there was something in the absurd visual of me fumbling with a letter opener– wearing floppy, yellow, rubber gloves– that made it all worthwhile. This is not the only time we use humor to fight hate. While our clowning of the white supremacists gathered a lot of positive attention– even national coverage from CNN, Huffington Post and others– we knew to expect renewed vigor from our angry pen pals. The new wave of hate has spewed our way, and although inevitable, it is a terrible reminder that there are still people in our community who react to difference with fear, hate and even violence. It is troubling to imagine people who perceive difference as a direct threat to their personal identity and culture. It is also difficult and sometimes scary to stand and face those who react to demographic shifts with fear, anger, and hate. But somehow a clown nose, a crazy wig and a willingness to laugh despite our fears make it a little easier. Perhaps if we were all a little more willing to laugh at ourselves it wouldn’t be so hard to see beauty in both our differences and our sameness. Maybe you agree, but if you don’t, send me a letter. I’ve got some big rubber gloves and an audience. Congratulations on your hate mail! I see it as a sign that you’re doing good work. Keep it up!